Montegrappa is the kind of brand that doesn't surprise anyone when they come up with something ridiculously over the top. Simply because, you know, thats what they are known for (think Sylvester Stallone and his 'Chaos' pen). 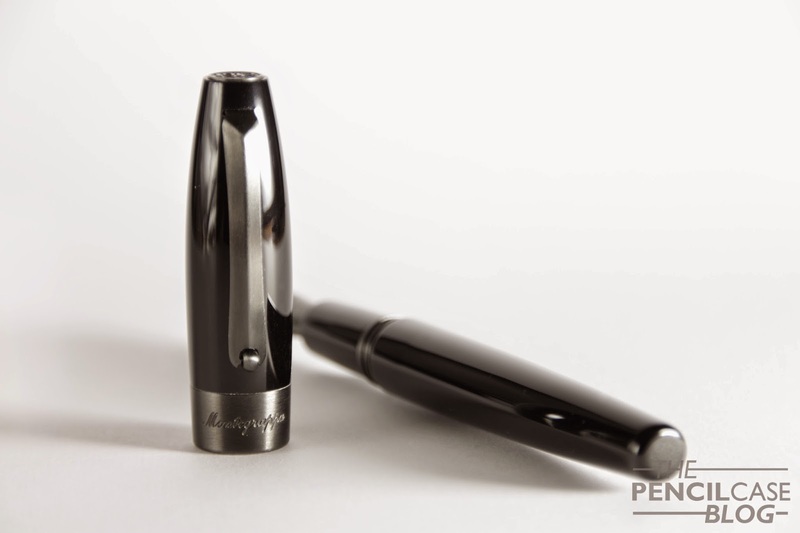 No, Montegrappa is the kind of brand that only really turns heads (or at least my head!) whenever they make something simple, elegant (affordable), like this, the Fortuna! 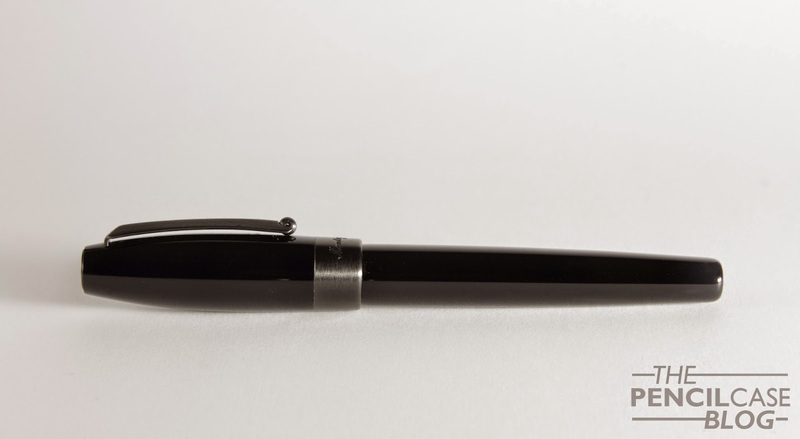 The Fortuna is, at least for Montegrappa's standards, a basic model. 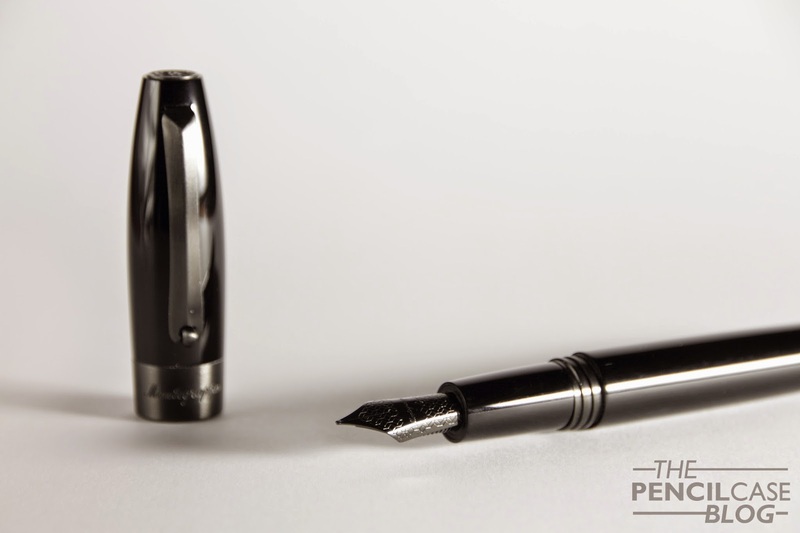 It comes equipped with a steel nib, it has a simple design, and it -only- costs about 300 hard-earned US dollars. Is it a good deal? Well, considering what 300 green pieces of paper could also get you (think pretty nice gold-nibbed pens), it probably isn't the greatest deal. Nevertheless, It's high on my 'want' list (sadly this one actually belongs to my dad). I never really used a Montegrappa before, so it was quite exciting to finally try one out. There's a lot of good reviews about Montegrappa pens out there, so I figured it would be great. And to some extent, it was indeed a very pleasant first experience. Especially designwise, this pen does the trick for me. The Fortuna comes in a variety of finishes, even an Italian flag version, with 'tricolore' resin! But none of them, really has the appeal this one has. 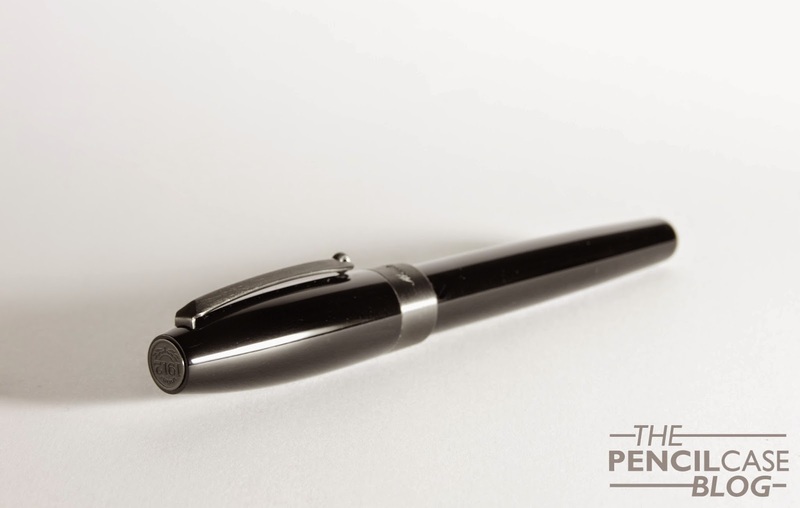 The shape of the pen in combination with the brushed black metal trims is what really makes this pen stand out (in an understated way). The Fortuna has pretty 'standard' dimensions, at 13.6cm capped, it's definitely not huge, but it's easily big enough to be used unposted. 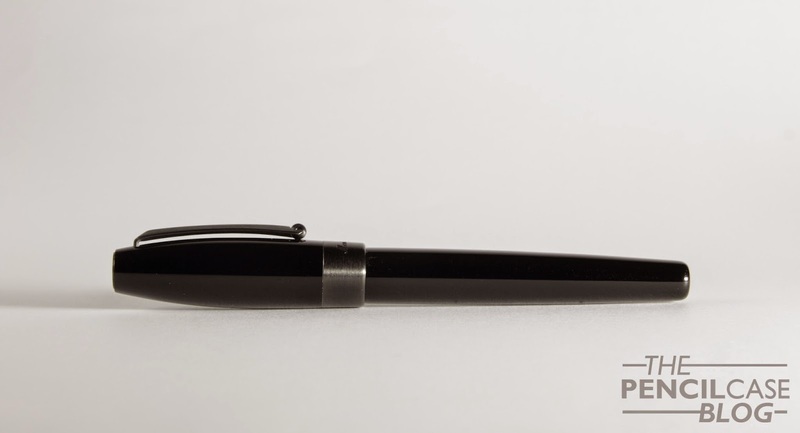 Posting the cap also works, and gives the pen a pleasing balance. I didn't post the pen that often, just because it feels like doing so will damage the resin barrel. Just looking at it, one can already tell it's a rather chunky pen to hold. And indeed, it does have a noticeably large diameter, which provides a comfortable grip, and fills the hand nicely. The threads are what -I believe- some brands would call 'block-cut' which basically means they are chunky and topped off. In theory, that would leave the threads less sharp and noticeable, but they are very crisply cut on this one, so they still felt a bit sharp when you'd run your finger over them. Fortunately, in normal use, these threads didn't bother me at all. What did bother me is that the resin parts of the pen are VERY succeptible to scuffs and scratches, as is almost always the case with this kind of material. Also, because it's all black resin, imperfections that will develop over time, will show up quite noticeably. Fit and finish is what really makes this pen worth its price. It doesn't have much bells and whistles to it, but the details that are in this pen, are perfectly made. The Clip has the typical 'wheel' that'll help attaching the pen to a shirt or jeans pocket. It's a fairly tight clip, but the wheel feature definitely helps here. The extremely wide cap band has 'Montegrappa' engraved at the front, that's all. 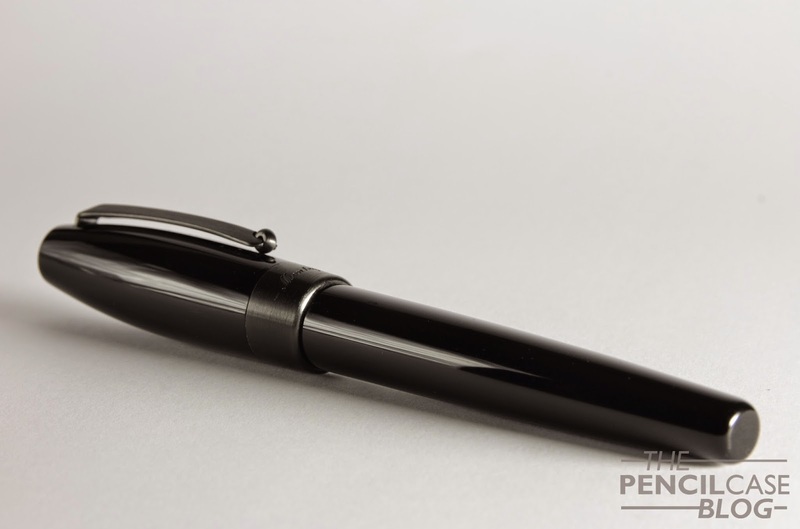 It's really weird, because normally I think cap bands can be somewhat detracting from the clean looks of the pen, but with this one it actually felt like something was missing at the back. Maybe 'made in Italy' engraved around the back of the cap would have been nice. 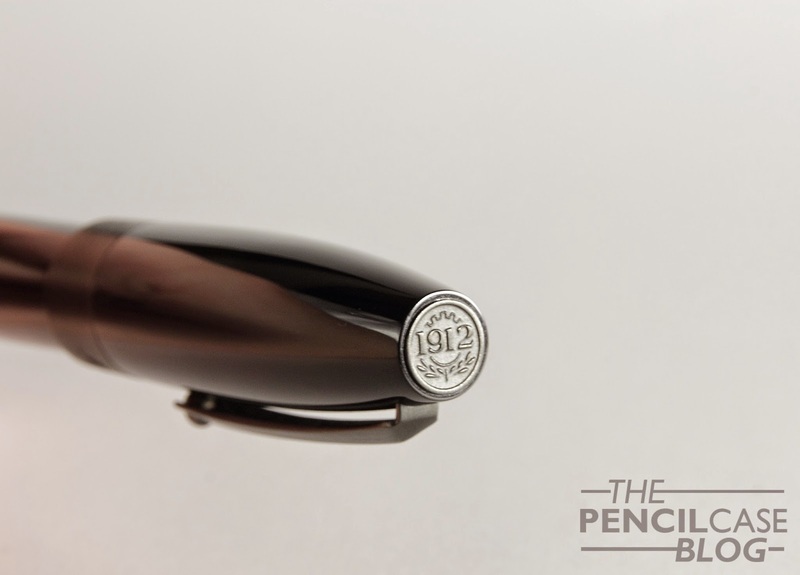 Another nice detail is the cap fineal: it says '1912', the year Montegrappa was founded. 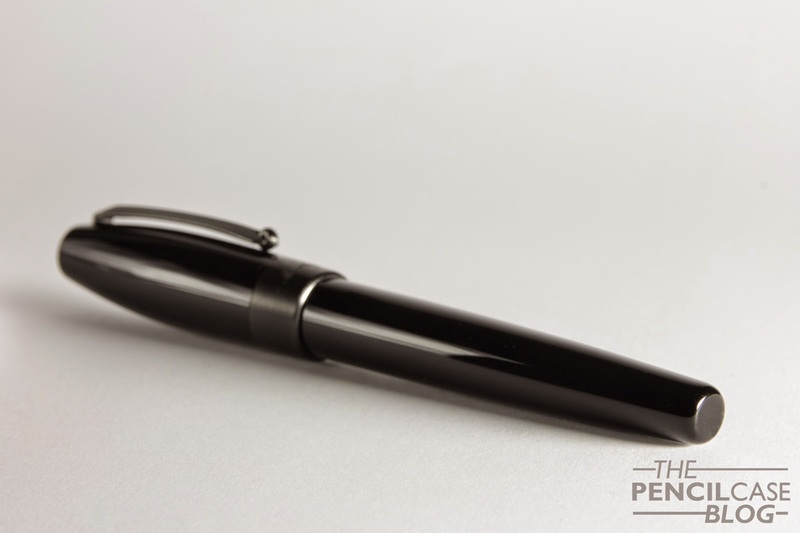 The writing end of the pen, the large, black-coated steel nib in Fine, was somewhat of a surprise at first. I expected a super-smooth, wet Fine nib, but what I got was a noticeable bit of feedback, and a very balanced flow (perhaps a bit more towards the dry side.). It didn't take long to get used to it though, and it's quite enjoyable to write with. I personally would have preferred a slightly more generous flow, but that's something that can be tweaked. Also, even though it writes a rather fine line (It's a true to size fine), the nib has a noticeable Stub character, which is quite nice because it adds a bit of flair to your writing. The nib is incredibly beatiful. It has a a nice motif engraved on it, the same motif that can also be found on most Montegrappa packaging and paperwork, a nice little detail. 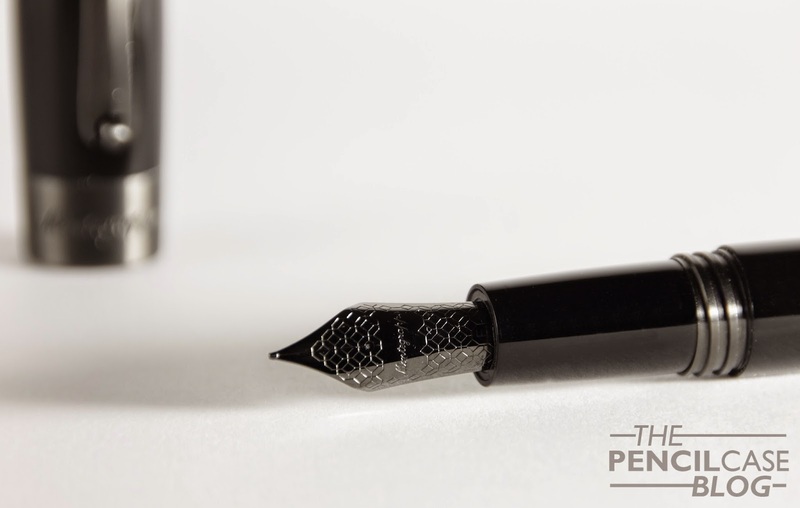 The black coated nib fits in perfectly with the design of the pen. Overall, I must admit it's slightly overpriced, at 190 EUR/ approx. 300 USD. I don't mind the fact that it has a steel nib, but it could have been a bit better. How I see it, you're mostly paying for the brand and the fact that it's absolutely gorgeous to look at. It's a pen I definitely wouldn't mind adding to my collection, but if you have a tight budget, and it's only about looks, but also about writing experience. I definitely think there's better to be had within this price class.